Restaurant Mekong at Marigold Hotel in Ameerpet introduces its new menu of contemporary cuisine. You get to eat deep ocean European fish cooked with Japanese sauces, which is a complete surprise. This change is what, the hotel, defines as ‘contemporary’. On the platter you have items like Lemon Grass Scented Mushroom Soup, Fresh Spinach Puree with Crab Meat Soup, Steamed Bun Basket, Hibachi Grilled Salmon, Butter Garlic Crab along with delicious dessert tray named Mekong Delight which consists of White Chocolate Blue Berry Mousse, Dark Chocolate Mango Jelly Mousse etc. The king of the cuisine is Baked Chilean Sea Bass, a deep Atlantic fish, priced at `1,800 per plate. 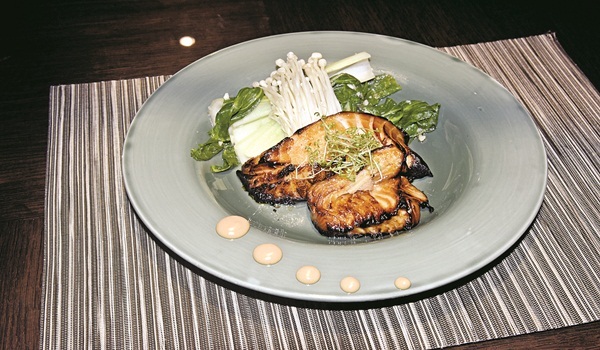 Ita��s Miso glazed baked cod-fish. Says corporate chef Tarak Nath Mukherjee about the dish, a�?We marinate it for 12 hours with Japanese paste Miso. We bake it in oven for 10 minutes on 200A? C using steam and heat method.a�?